Last week, on 20th June 2013, The Indigo Trust hosted a working lunch which brought together data experts and civil society representatives to explore the how we could encourage UK Foundations to publish their data in an open format in order to make grant giving more effective. We believe that being transparent in itself is the right thing to do, but the reasons for encouraging openness go far beyond this. In summary, openness makes grant making better. We believe that opening up grant data will enable more effective collaboration amongst funders and between civil society and funders, allow for more effective strategic planning which will ensure that money gets to where it’s needed the most, enable grant-makers to assess their impact and demonstrate this to the public and enable analysis of interventions across a whole sector such as health or higher education. A great example of how open data can lead to better understanding of a sector is demonstrated here, where Water, Sanitation and Hygiene funders released their data to enable more effective collaboration and programmatic design across the sector globally. 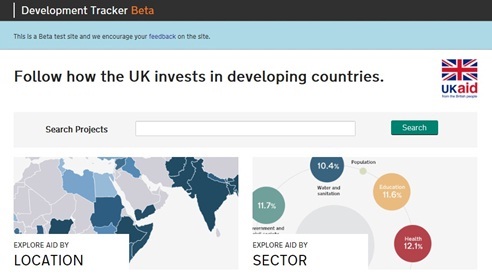 DFID’s development tracker is another excellent example of the power of open data and enables users to trace aid flows globally. It’s exciting to see a movement towards such openness globally, with interventions such as the Open Government Partnership. The UK has also taken a lead in this movement, with DFID publishing all its data to an IATI standard and being ranked first in terms of Aid transparency by Publish What You Fund. The UK has also taken a lead in developing the G8 Open Data Charter. Now it’s time for Foundations to play their part. We have set ourselves an ambition to ensure that within 5 years, 80% of grants made by UK charities, foundations & other grant makers are reported as open data to agreed standards and 50% by number/volume. This should enable grant-makers in the UK to have a clear understanding of who has funded what, where and for how much, enable more strategic philanthropy and collaboration and improve transparency for the public and authorities. Watch this space for further details on how we intend to move forward with this programme. If you’re a Foundation, open data expert or civil society group and you’re interested in getting involved in this initiative, please don’t hesitate to contact us.